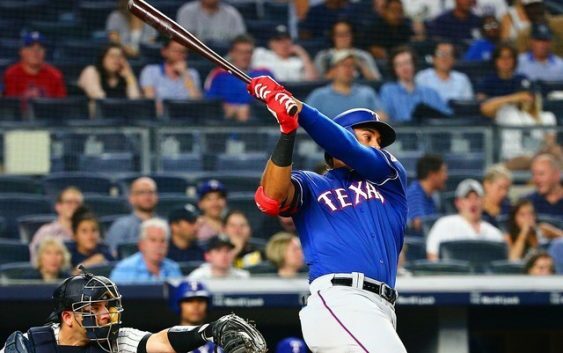 Ronald Guzman became the youngest player since Mickey Mantle to homer three times at any version of Yankee Stadium, and the Texas Rangers beat the New York Yankees 12-7 on Friday night. 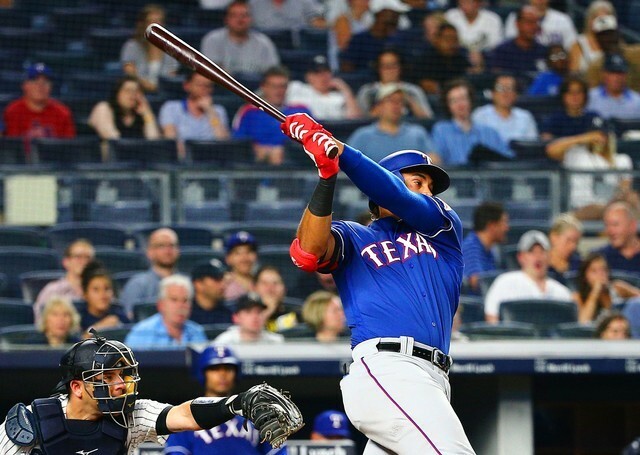 The 23-year-old Guzman recorded the first three-homer game in the regular season by a Ranger since Adrian Beltre on Aug. 22, 2012. He matched the feat achieved by a 23-year-old Mantle on May 13, 1955, against the Detroit Tigers and hit two homers off Masahiro Tanaka (9-3). Guzman is also the first rookie to ever have a three-homer game against the Yankees. Guzman now has 12 homers this season; six are against the Yankees. Texas won for the 10th time in 14 games. Xander Bogaerts and Andrew Benintendi each hit three-run homers, and Boston rallied from an early five-run deficit to defeat host Baltimore in a slugfest. Bogaerts’ homer gave Boston a 3-0 lead in the first against Dylan Bundy. Benintendi hit a three-run blast off Donnie Hart in the seventh to put Boston in front 14-10. Bogaerts drove in four runs while Benintendi knocked in three, as the Red Sox improved to 11-2 versus the Orioles this season. Baltimore had used back-to-back four-run frames in the second and third for an 8-3 lead before Boston battled back. Ryan McMahon came off the bench and hit a two-run homer, DJ LeMahieu also homered and Colorado edged Los Angeles in Denver. Chris Iannetta had two hits and Jake McGee (2-4) got the win in relief for Colorado, which snapped a three-game losing streak. Adam Ottavino pitched the ninth to get his fifth save in eight opportunities. The news wasn’t all good for the Rockies. All-Star third baseman and MVP candidate Nolan Arenado left the game in the fifth inning with a right shoulder injury. Arenado tweaked his shoulder on a relay throw to first on a double-play ball in the third inning. Manager Bud Black said on the broadcast that the move was precautionary. Anthony Rizzo drew a bases-loaded walk in the bottom of the seventh inning to force in the tiebreaking run and give Chicago a victory over visiting Washington. The Cubs finished with just four hits. But they drew six walks, and that helped them as Rizzo walked three times, scored once and drove in the deciding run on a free pass. In the seventh inning, with the game tied at 2, the Cubs loaded the bases with three singles against Sammy Solis (1-2) and Greg Holland. Rizzo walked on four pitches for the winning run. Kevin Gausman allowed only one run over eight innings to win his first start at home since being acquired at the trade deadline as Atlanta overpowered Milwaukee. Gausman (1-0 with Atlanta, 6-9 overall) allowed one run on six hits and struck out eight, two shy of his career best. Gausman looked more at ease than in his first start with the Braves, when he allowed three runs in five innings against the Mets. The Braves accumulated 13 hits, with third baseman Johan Camargo going 4-for-5 with two doubles and left fielder Ronald Acuna Jr. going 3-for-5. Center fielder Ender Inciarte had two hits and drove in four runs, and right fielder Nick Markakis had two hits, both doubles, and drove in three. Jacob Nix held Philadelphia scoreless over six innings in his major league debut and catcher Austin Hedges hit his fifth homer in a span of 12 games as host San Diego claimed victory. Nix and relievers Matt Strahm, Craig Stammen and Kirby Yates combined on an eight-hit shutout — only the Padres’ third shutout of the season. Yates earned his fourth save, retiring the final three hitters after giving up back-to-back singles to Odubel Herrera and Maikel Franco to open the ninth. Nix, a 2015 third-round draft pick, gave up four hits and two walks with four strikeouts while throwing 88 pitches. He worked out of jams in the first and second innings before retiring 13 of the last 14 Phillies he faced. Nelson Cruz hit a two-run double with the bases loaded to key a three-run eighth inning as Seattle rallied past host Houston. Cruz drove home Mitch Haniger and Denard Span with his double to left-center field off Astros reliever Ryan Pressly. Haniger and Span reached in succession with one out against Astros starter Gerrit Cole before Cruz rallied from an 0-2 count to snap a 2-all deadlock. Kyle Seager followed with a run-scoring groundout to score Jean Segura, who was hit by the first pitch Pressly threw upon entering the game. Cole (10-5) suffered the loss in a third consecutive start. Home runs by Kole Calhoun and Justin Upton were enough to help lift Los Angeles to victory over visiting Oakland. Calhoun hit a two-run homer in the third inning and Upton a two-run homer in the sixth, allowing the Angels to overcome an early 3-0 deficit. Angels starter Felix Pena gave up three runs in the first inning on a solo homer by Matt Chapman and a two-run homer by Khris Davis, but allowed nothing more until being replaced with two out in the sixth. Jim Johnson (4-2) made just four pitches to get the final out of the sixth inning and pick up the win. Matt Carpenter hit his National League-leading 32nd home run during a five-run second inning as St. Louis blanked host Kansas City. Carpenter has homered in three straight games — his third homer streak of at least three games since July 14, a span of just 24 games. He homered in six straight games from July 14-21, during which he hit eight round-trippers, and he homered in three consecutive contests from Aug. 3-5. Austin Gomber (2-0), making his third big league start, cruised to the win after allowing four hits and one walk while striking out three over five innings. Andrew McCutchen hit Clay Holmes’ third pitch of the game for a home run, triggering a 16-hit attack that sent San Francisco past visiting Pittsburgh. Buster Posey and Alen Hanson combined for seven hits and six RBIs for the Giants, who evened the four-game series with National League wild-card implications at a game apiece after the Pirates had taken the opener 10-5 on Thursday night. The Giants scored three runs in the first inning, four in the third and three more in the fourth to build a 10-2 lead and held on despite getting out-hit by the Pirates 17-16. Daniel Palka hit a walk-off home run in the bottom of the ninth inning to lift host Chicago over Cleveland. Palka drove his 18th homer of the season over the left field wall on a 1-2 count. It marked the White Sox’s second walk-off shot of the season, following Trayce Thompson’s game-winning blast May 3 against the Minnesota Twins. Indians designated hitter Edwin Encarnacion left the game early because of what the team described as left arm discomfort. He drew a walk in the first inning and swiped second base as part of a double steal in which Francisco Lindor took third. Two runs scored on Billy Hamilton’s seventh-inning bunt single, helping Cincinnati build upon a narrow lead en route to victory over visiting Arizona. Reds right-hander Anthony DeSclafani (6-3) pitched seven shutout innings. Raisel Iglesias pitched around a Paul Goldschmidt double in the ninth to record his 22nd save. Diamondbacks right-hander Clay Buchholz (5-2) was pulled after seven innings, having allowed three runs (two earned) and eight hits. He walked two and struck out four. Zack Wheeler won his fifth straight decision, leading New York to victory at Miami. Wheeler (7-6) allowed four hits, one walk and two runs in seven innings, striking out eight. Miguel Rojas’ two-run homer in the seventh snapped Wheeler’s streak of 23 2/3 scoreless innings. Miami didn’t get its first hit until Martin Prado singled leading off the fifth. Marlins catcher J.T. Realmuto doubled in the sixth, snapping his 0-for-23 hitless skid. Jose Urena (3-12) took the loss, allowing eight hits — all singles — one walk and four runs in 5 1/3 innings. Niko Goodrum and Jose Iglesias each blasted two-run homers, and Detroit bounced back from an 0-6 road trip to down visiting Minnesota. Goodrum’s 11th homer and Iglesias’ fifth allowed Jordan Zimmermann (5-4) to snap a personal four-game losing streak. Zimmermann allowed two unearned runs while giving up eight hits in 6 1/3 innings. Shane Greene gave up a ninth-inning run but collected his 24th save. Jorge Polanco and Logan Forsythe each had two hits and a run scored for the Twins. Ervin Santana (0-1), making his fourth appearance this season, gave up five runs on three hits in six innings. Blake Snell pitched a perfect five innings before being removed, Michael Perez hit a two-run homer and Ji-Man Choi added a solo shot as Tampa Bay blanked host Toronto. Snell (13-5) had six strikeouts without allowing a base runner before being replaced by right-hander Jake Faria to start the sixth. The southpaw was making his second start since a stint on the disabled list with shoulder fatigue. Joey Wendle had three RBIs with a sacrifice fly and a double for the Rays, who are 6-1 against the Blue Jays this season after taking the opener of a three-game series.